CHICAGO – In the latest HollywoodChicago.com Hookup: Film, we have 75 pairs of advance-screening IMAX movie passes up for grabs to the highly anticipated epic action/adventure “Seventh Son” starring Ben Barnes, Julianne Moore and Jeff Bridges! increased this giveaway from 25 pairs to 75 pairs! “Seventh Son,” which opens on Feb. 6, 2015 and is rated “PG-13,” also stars Djimon Hounsou, Alicia Vikander, Olivia Williams and Jason Scott Lee from director Sergey Bodrov and writers Charles Leavitt and Steven Knight based on the book series “The Last Apprentice” by Joseph Delaney. To win your free “Seventh Son” IMAX passes courtesy of HollywoodChicago.com, just get interactive with our social media widget below. That’s it! This screening is on Wednesday, Feb. 4, 2015 at 7 p.m. in downtown Chicago. The more social actions you complete, the more points you score and the higher yours odds of winning! Completing these social actions only increases your odds of winning; this doesn’t intensify your competition! In a time of enchantments when legends and magic collide, the sole remaining warrior of a mystical order (Oscar winner Jeff Bridges) travels to find a prophesized hero born with incredible powers: the last Seventh Son (Ben Barnes). Torn from his quiet life as a farmhand, the unlikely young hero embarks on a daring adventure with his battle-hardened mentor to vanquish a dark queen (Julianne Moore) and the army of supernatural assassins she has dispatched against their kingdom. Sergei Bodrov directed “Seventh Son” from a screenplay by Charles Leavitt and Steve Knight and a screen story by Matt Greenberg based on the book series “The Last Apprentice” by Joseph Delaney. The film is produced by Basil Iwanyk, Thomas Tull and Lionel Wigram. Jon Jashni, Brent O’Connor and Alysia Cotter are executive producers with Jillian Share and Erica Lee co-producing. The film will be released in 3D. 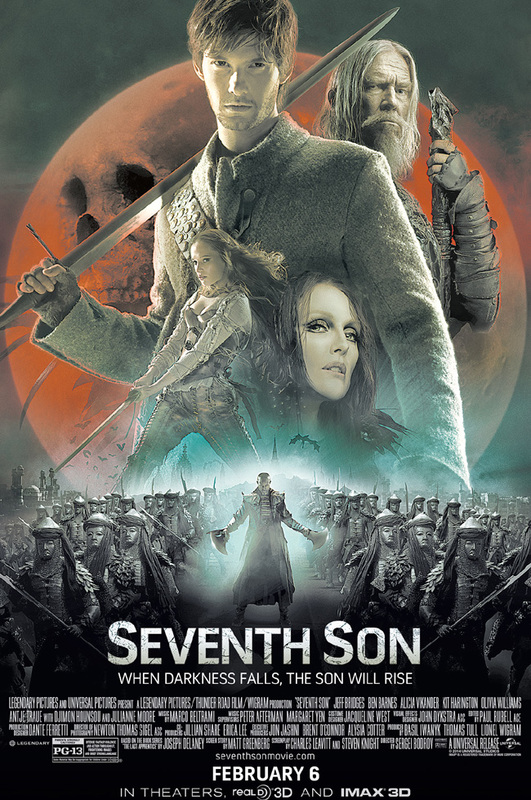 The movie poster for “Seventh Son” starring Ben Barnes, Julianne Moore and Jeff Bridges. This HollywoodChicago.com Hookup is simple! Just get interactive in our social media widget above. We will award 75 admit-two IMAX movie tickets based on social entry numbers and/or randomly via e-mail for our “Seventh Son” Hookup. Good luck!